Cheap Personal Training Certification  – Which Are the Cheapest Accredited Options? If you’re thinking of becoming a personal trainer, the cost of certification could be a barrier to starting. The average price is around $600-$800 for learning materials and exam, which is a lot of money. Some certification packages can even cost $1000 or more. What if you can’t afford to spend $600+ to get certified? Are there cheap personal training certifications that can still get you a job? The short answer is: yes. There are cheaper personal trainer certifications on the market. You certainly don’t need to spend thousands to get certified. It’s important to know what you’re getting with a certification though – including the ongoing costs and career prospects. While some certifications are cheaper than others, it's important to choose an organization that's accredited and well-respected. My two top picks are ISSA and NCSF. Both have accreditations (DEAC and NCCA respectively) and are relatively inexpensive. They also have relatively cheap renewal and CEU requirements. Each certification has a different pricing structure. Some are cheaper upfront, while others cost more initially but are less expensive in the long run. It’s important to know what you’ll be paying now and throughout your time as a certified trainer. Learning Materials. Most certifications have a set of core learning materials. These are often presented in textbook or PDF format, and are designed to prepare you for the exam. Along with the core materials, the organization may offer live workshops, online webinars or access to a mentor. The cost of learning materials varies a lot between certifications. Materials are usually sold in packages, but some schools (such as NSCA) let you buy individual books separately which can save money. Exam (and Retakes). The exam usually costs less than learning materials, but still averages around $300-$400 for a single entry. If you fail, you’ll need to pay for a retake which can cost between $50-$200. Renewal. All certification schools require you to recertify every two or three years. This can cost as little as $50 every three years for NSCA, up to $139 every two years for ACE. Continuing Education Units. The renewal fee is only part of the story though. You’ll also need to complete continuing education units, which cost money. While these are an investment in your future, some certifying organizations require more than others. The more hours of CEUs you need to complete, the pricier it’ll be to renew. To summarize this section, whether a cert is cheap or expensive doesn’t just depend on the price of the exam. Make sure you know the full costs before you buy. Before I get to the cheapest certifications, I need to add a short disclaimer. 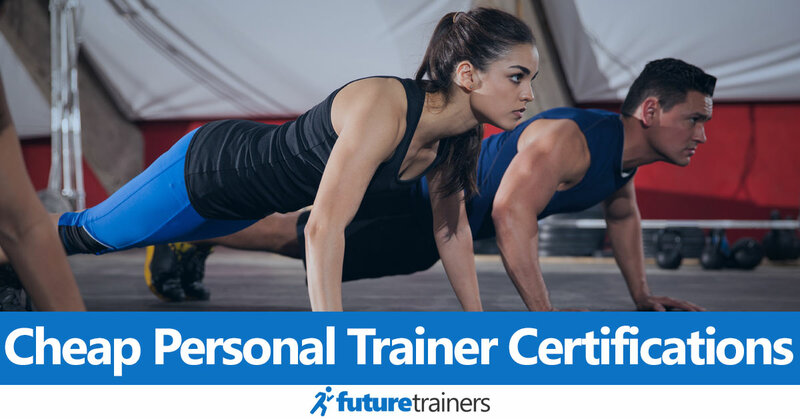 Getting certified as a personal trainer is the first step towards a new career. The right certification for you depends on your goals. Is the certification geared towards the type of clients you want to work with? Does it provide the learning materials you need to succeed? And is it accepted by the gyms you want to apply at? For this reason, I don’t recommend choosing a certification based on price alone. The best certs are accredited by a recognized organization and are respected by gyms. The cheapest personal trainer certifications usually aren't – and may make it more difficult to find a job. How can you tell which certifications should be avoided though? Stay away from certifications that aren’t accredited by either the NCCA or DEAC. These might be cheap, or even free in some cases, but they aren’t as well-respected in the industry. They also aren’t widely accepted by gyms, so you’ll find it harder to get a job (which is the purpose of getting a certification). You should also contact your primary employment options and ask whether a certification is accepted. You should do this for any cert though, not just cheaper options. It’s also true that just because a certification is expensive doesn’t make it high-quality. Even amongst NCCA or DEAC-accredited courses, there is still variation in price. If you’re looking for a cheap personal training certification that’s accredited and well-respected, my top picks are ISSA and NCSF. Here’s an overview of these two certs. ISSA is a popular online certification that made it onto our list of the best certification programs. It’s not NCCA accredited, but is accredited by the DEAC. ISSA provides a well-rounded study program and is partnered with several major gym chains (such as Curves and Urban Active). There’s only one study package available. This costs $599 and includes all learning materials and the exam. The payment structure is less flexible than other certs, but it takes away the stress of choosing from a variety of packages. While the total cost of $599 isn’t that much cheaper than alternatives such as NASM or ACE, there are a few advantages to choosing ISSA. Firstly, the exam can be taken online. This means you don’t need to worry about the cost of travelling. It’s also more convenient and fast – especially if you don’t live in a major city. The standard package also includes a free retake token. Even if you fail the exam twice, the $50 retake fee is considerably cheaper than other certifications. Additionally, ISSA only requires 20 hours of CEUs every two years and a recertification fee of $99. This is the same as NASM, but is likely to work out cheaper than the 60 hours of CEUs required every three years by organizations like NSCA. There’s also an interest-free payment plan option if you buy it online. This allows you to spread the cost of certification over a longer period. While ISSA is an excellent certification, make sure you check it’s accepted by your employment options. You don’t want to pay for the certification before finding out that the gym you want to work only accepts NCCA-accredited certs. Another low-cost option if you’re looking for a cheap personal training certification is NCSF. The NCSF exam is accredited by the NCCA, so it’s accepted by a wide range of gyms, and there are several packages available. Another advantage of NCSF is that it only requires 10 CEUs every two years, which is one of the lowest for an accredited organization. The renewal fee of $75 is also cheaper than most. To summarize, if you're looking for a cheap online personal training certification, go for ISSA. If you don't mind travelling to your exam and prefer the learning materials of NCSF, it's a cheaper choice that's also NCCA-accredited. There’s a big difference between getting a great certification for a low price and paying for certification that has little value. 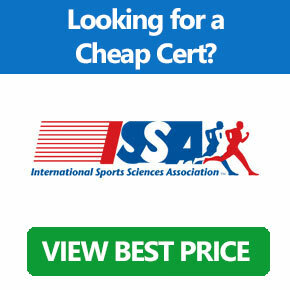 Unfortunately, the lowest cost “certifications” on the market aren’t widely accepted by gyms. This makes them a waste of money even if they seem cheap and easy. With that said, there is still a lot of variation in price amongst the best certs. The cheapest way to get a certification is to pay for the exam only. This could be a good option if you already have access to the learning materials for a cert, such as from a friend who has already taken the exam. If that’s not an option though, I think ISSA and NCSF are two great choices. Both are accredited (although ISSA is accredited by the DEAC rather than NCCA) and have great learning materials. They are also well-respected in the industry, which can make it easier to find a job. Before choosing any certification, however, make sure you check that your future employers accept it. Even if you’re not sure where you want to work, ring some local gyms to find out which certifications they accept. Most importantly, it’s worth paying a few hundred dollars extra to get a great certification that’s accredited and widely accepted. Don’t be fooled by the cheapest certifications that are unaccredited – they usually aren’t worth the money.